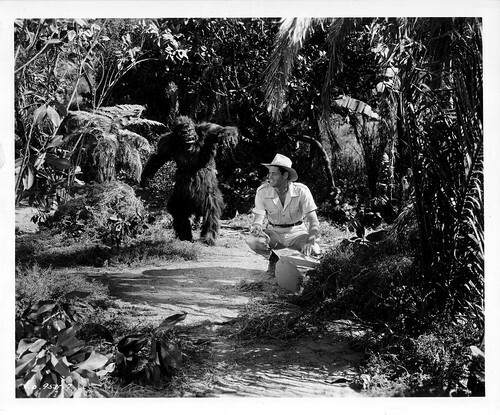 I have tried three times to watch MARK OF THE GORILLA (1951) and I have yet to make it through without snoozing! It's by no means a terrible film but not one to excite the mind of a sleepy, old curmudgeon who has to watch gorilla suit flicks after the missus has gone to bed. 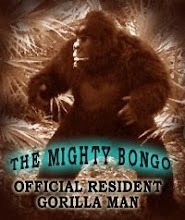 I have a particular fondness for films that have the gorilla suit itself as a plot point. 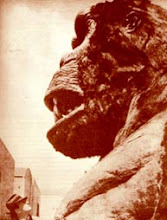 Rascally white men, in full simian regalia, are using the fear of the great ape to intimidate and harass African locals to do something dastardly that I forget because I keep nodding off. Naturally our hero Jungle Jim is not deterred. I was familiar with Weissmuller from the Tarzan films but I was unprepared for his decidedly unimpressive line delivery. When pressed to utter poly-syllabic words he seems to fall a little flat. I certainly prefer, "Me Tarzan, you Jane." This still recently arrived at the Gorilla Den and features the sneaky tip-toeing of Steve Calvert. 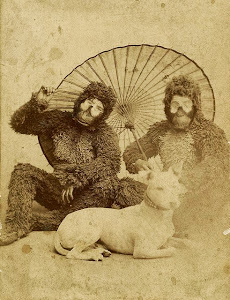 I stumbled across your blog by accident while doing research for an article on gorilla-suit actors. 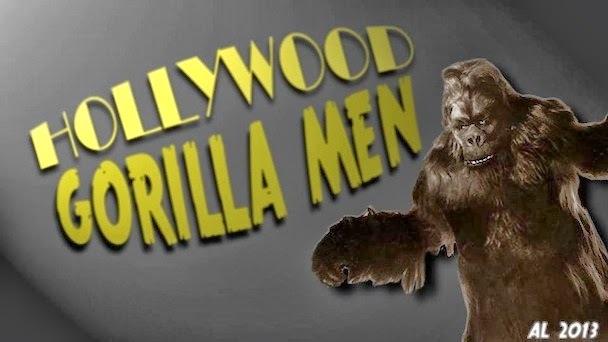 Gorilla Men promptly blew all my earlier research out of the water, and completely floored me with the level of devotion you've given what I thought was an obscure topic no one but myself would ever be interested in. I'll be citing your blog in my article. Amazing what a simple google search on Charles Gemora turned up for me!